Rosa Blum and a liberator will speak at an event at SMU commemorating the 70th anniversary of the liberation of the Nazi death camps. 2015 marks the 70th anniversary of the liberation of most of the Nazi death camps, and it is with sadness that we must note that most of the brave soldiers who freed the remaining camp prisoners are no longer with us. Our debt to these men will never be repaid. Not only did they save the lives of Nazi victims, but they also brought the stories of the atrocities they saw back to their homelands so that everyone could learn from the tragic ramifications of hate. It is a rare opportunity today to hear a liberator’s story in person, which is why you shouldn’t miss Southern Methodist University’s upcoming event that commemorates the 70th anniversary of the liberation of the concentration camps. Bernhard Storch, who was imprisoned in a Soviet labor camp before becoming a death camp liberator in the Polish army, and Auschwitz survivor Rosa Blum will speak 6 p.m. at SMU’s Elizabeth Perkins Prothro Hall. Visit the Museum’s events calendar to learn more. 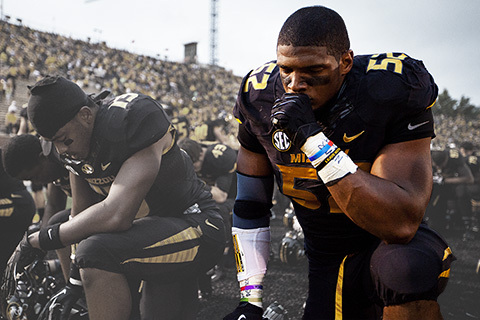 Whether you follow people who tear across the football field or tear up the dance floor, no doubt Michael Sam has been on your social media feed lately. Now you have a chance to hear what the multi-talented football player is up to in person. Sam, the first openly gay man to be drafted into the NFL, will speak on March 26 as part of the Dallas Holocaust Museum/Center for Education and Tolerance’s 2015 Upstander Speaker Series. The series brings leading human rights advocates and academics to Dallas to share their knowledge and research on a spectrum of issues, including modern-day genocide, ethics, prejudice and law. Sam set the Internet spinning when he announced recently that he’ll be a contestant on Season 20 of ABC’s Dancing with the Stars. He’s stressed, though, that he’ll continue training so he can show off his moves on the football field if a team comes calling for the 2015 NFL season. Sam has a lot going on, but he’ll stand still long enough on March 26 to speak to the North Texas community about his past whirlwind year and his decision to come out despite repercussions it may have on his career in the uber-macho world of professional sports. Sam’s a natural for the Dallas Holocaust Museum’s second Upstander Speaker Series, which raises fundamental questions about humanity, justice and personal responsibility. It challenges audiences to consider these issues and stand up against injustice rather than stand by. Sam grew up in Hitchcock, Tex. along the Gulf Coast. He is the seventh of eight children. Three of his siblings have died and two brothers are in prison. He is the first of his family to graduate from college. Sam, now 25, was selected by the St. Louis Rams in last year’s draft but was released before the start of the season. He was signed to the Dallas Cowboys practice squad but did not make it to the game-day roster. The nation has followed Sam’s progress in the NFL closely. Sam has been accepted to the first NFL veteran combine, a project aimed at giving a second chance to players who are free agents. That combine is set for March 22. The Upstander Speaker Series with Michael Sam and introduction by WFAA-TV sports anchor Dale Hansen will take place March 26 at 6:30 p.m. at Communities Foundation of Texas, 5500 Caruth Haven Lane in Dallas. For more information and tickets, visit DallasHolocaustMuseum.org. 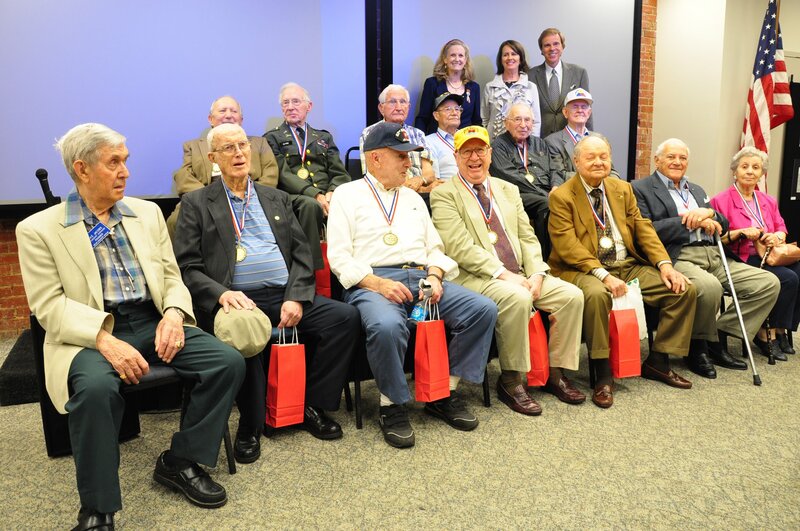 Last Wednesday, the Museum and the Daughters of WWII hosted an event for Victory in Europe Day. The original V-E Day, May 8, 1945, marked the end of WWII in Europe, as the Nazi regime officially surrendered. Fittingly, our program focused on the WWII veterans who assisted in liberating concentration camps and the Holocaust Survivors who were freed as a result of Allied victory. We began the event with the recitation of the Pledge of Allegiance and an inspirational rendition of the National Anthem. To hear these American soldiers who were part of such an important event in our history singing alongside Holocaust Survivors from across Europe who are now proud to live in America was moving. Being able to sing with them was truly an honor for those of us in the audience who were there to hear their stories and honor their legacies. As the event progressed, we heard from several men who each played a different role in liberating the camps. Some were medical personell, others spotted the camps and reported their location to their commanding officers, a few shared their stories of being among the first to see the prisoners, to notice the dead, to experience the horrors of these places the Nazis abandoned and later, denied. No matter the role they played, each of the liberators had a unique story to tell. It was fascinating, yet chilling, to hear about the first impressions of these men. Many of them described the horrible smell that made them want to run away as soon as they neared the camps. They described living skeletons, zombie-like men and women, and the bones of the dead, laying out in the open for all to see. More than once, the audience was in tears, or gasped collectively at the true stories of what it was like in the camps. We all felt shock at the cruelty humanity is capable of, as the soldiers did many years ago, seeing it in person. That feeling of shock is one reason events like these are so important. The raw, fresh feelings at the injustice of it all, the pure evil enacted on one man by another, the resolve these feelings bring to never stand by and let this happen again. 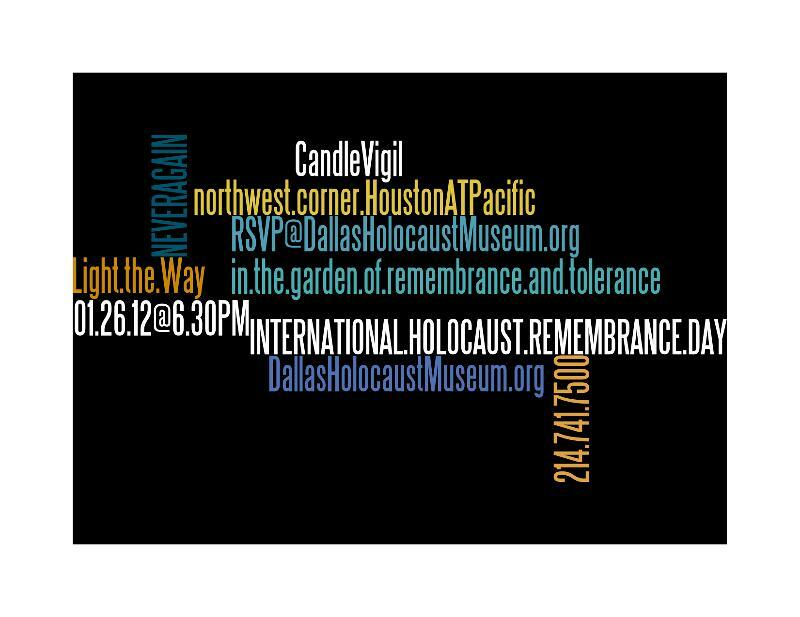 Join us at the DHM/CET Garden of Remembrance and Tolerance on January 26 for a candlelight vigil in recognition of Holocaust Remembrance Day and those who lost their lives in the Holocaust. The Garden of Remembrance is located at the corner of Houston & Pacific Streets in the West End, opposite the Sixth Floor Museum. Arrive and park on this site by 7 p.m. In the event of rain, we will gather in the DHM/CET Memorial Room inside the museum at 211 N. Record Street, located one block east of the garden. Candles, seating and light refreshments provided.